If you’ve been following League of Legends‘ Frejlord update along with us, you know it’s been in the works for a relatively long time with the most recent glimpse coming from the PBE’s splash art update. The day that this update releases draws closer and closer and as such Riot Games has began releasing the champion spotlights for some of the reworks that we’re going to be seeing. 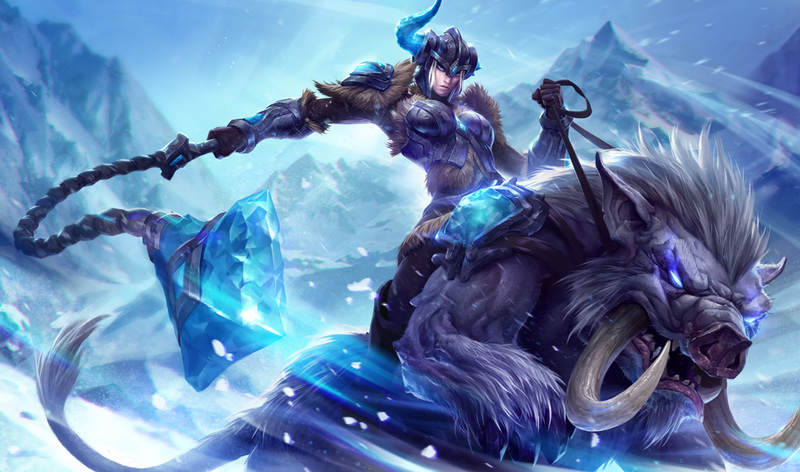 Today we have two in the form of Sejuani, the Winter’s Wrath, and Trundle, the Troll King. In this edition of the Champion Spotlight, you’ll learn how to freeze enemies into ice-cubes, hurtling from the jungle as Sejuani, the Winter’s Wrath. As a tanky, crowd-control machine, Sejuani tears through monster camps and pressures lanes with high-impact ganks. Her full suite of spells suited perfectly for securing kills, Sejuani bursts from the jungle to knock opponents into the air with Arctic Assault. Once stunned, she whittles them down with Flail of the Northern Winds, and eliminates any escape plans using Glacial Prison. Her early game pressure translates to late game initiation and her crowd control can peel enemies off allied champions. From the early game to the end stage, the Winter’s Wrath brings home the bacon. Check out the video for tips, tricks, and sample runes and masteries for going full boar as Sejuani. The sustain from King’s Tribute and Frozen Kingdom keep Trundle’s health topped off as he quickly tears through the jungle. By keeping his health high, Trundle’s ready to seize an opportunity to gank, pressure lanes or counter-jungle. A clutch Froze Pillar can block enemies’ escapes routes, slow down stragglers and disrupt positioning in team fights. And when enemy champions get a little too tanky, Subjugate allows Trundle to steal valuable defensive stats from his target, reducing a scary threat into a tasty troll snack. Check out the video for tips, tricks, and sample runes and masteries when playing as Trundle. Each of these champions looks to become relevant once again and both have the ability to jungle well. It’s certainly an exciting time to be a fan of League of Legends as it’s not often that we see and update this big release all at once. Who’s excited? I know I am.